I got the weirdest phone call last night. The editor of Gawker, A.J. Daulerio, contacted me, requesting information on lucid dreaming. He said he’s doing a new piece on lucid dreaming and Jared Loughner, who was sentenced yesterday with life in prison without parole for his deadly rampage in Tuscon, AZ in January 2011. “Nope, never spoke with him,” I replied. That’s when my nervous laughter began. Good to know that I laugh when I’m freaking out, it must be my Irish heritage. “Um, do you have a reply from me?” I asked, cringing. No reply, he says… but maybe I have it? I have no recollection so I tell him I’ll get back to him. 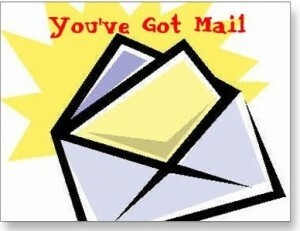 I got home and did a search for Loughner in my email database. Ping. With an increasingly icky feeling, I saw that not only had he emailed me, but I had responded. Time stamp: February 2009. A full 23 months before the shooting. I reread Loughner’s email to me and instantly understood why I didn’t remember it: it was very, very forgettable. By any reasonable standard, it was a polite inquiry about dreams, like the kind I get each and every day. No weirdness. No nonsensical queries. Even with the typo, it was a totally normal request, and I sent him a reply back a few days later and forgot about it. Below you can read Loughner’s email to me and my reply. I’m attaching the emails as screenshots, and have blurred out only our email addresses. The “knol” Loughner is referring to is an article on lucid dreaming I wrote for the now-defunct Google Knol project. But the history of lucid dreaming section of that knol is available here. In my response, I hesitate to recommend melatonin. That stuff is not candy, y’all. 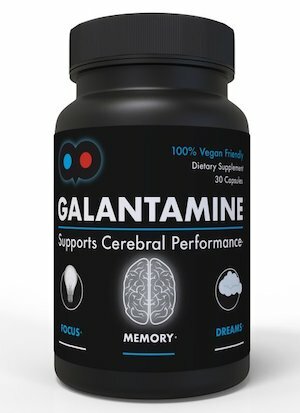 Supplements alone are not a healthy approach to lucid dreaming. 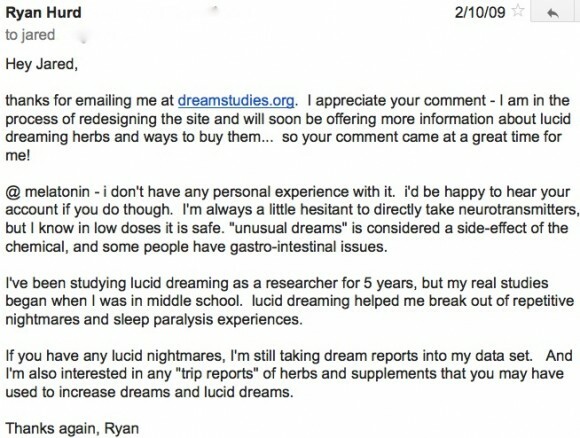 And melatonin is a crappy supplement for lucid dreaming anyways. I invited Loughner to feel free to submit me some examples of his own lucid dreams, which he never did. It’s sobering to know that a man who later became a convicted mass-murderer was reading my blog and corresponding with me in 2009. As I suggested to the editor of Gawker, as an online educator, all I can do is hope that my work helps people. 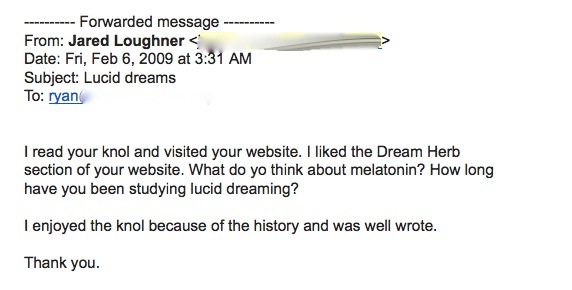 It’s especially sobering as I provide educational material about lucid dreaming, which will probably, once again, get some media buzz as being a “cause” to Loughner’s descent into schizophrenia. This correlation simply does not hold water. The real connection of mental illness and lucid dreaming: people who suffer with mental illness often also have arousal disorders, which can increase the likelihood of hallucinations at sleep onset, and may increase the chance to have a lucid dream due to increased awakenings throughout the night. But millions of healthy people have lucid dreams every night. And millions more experience sleep onset hallucinations that seem extraordinarily vivid, which coincidentally is a central theme of Oliver Sack’s new book Hallucinations. Sacks’ point: hallucinations are not just the mark of psychosis. More commonly, they are the mark of being sleep deprived, stressed, drugged or physically exhausted. People with narcolepsy and partial blindness and also experience hallucinations without losing their mind. Anyhow, Loughner didn’t become a murderer because he was a lucid dreamer, no more than he did because he smoked copious amounts of ganja. He was sick, he needed help, and the saddest part of this case is that the people in his community knew it but seemed powerless to help him. One more thing: it’s not weird to me that I corresponded with someone who turned out to be mentally ill. This probably happens more than I am aware — and that’s true for all of us. Those suffering with mental illness routinely hide their illness, and most do it pretty well. They are not “them.” “They” are us. Bouts of clinical depression, schizophrenia and other personality disorders and psychoses can come and go. Most people heal, picking up where they left off — at least that’s true for those who have community support. Elyn Saks eloquently describes what this looks like from the inside in this TED talk. Society, and especially media, has a way of othering those with sicknesses that we don’t understand. Even though people with mental illness may commit more violent crime (under stressed conditions) than those without, this doesn’t mean that all schizophrenics and other folks with personality disorders are murderers-to-be, waiting to blow up like a greasy stick of dynamite. This is another logical fallacy. In fact, those with substance abuse problems (including alcoholics) are more likely to be violent than schizophrenics, but as a culture–and perhaps it’s part of human nature — we are much more scared of the sensational and seemingly random acts of violence than the systematic violence that happens around us every day . And it is far more likely that people with a serious mental illness will be the victim of violence, not the perp. Our mental health facilities are less funded than they have been since the 1970s. This problem will continue to get worse until we start supporting the mental ill amongst us again. Under all the misplaced fear about the dark side of lucid dreaming, there is a small grain of truth: the practice of lucid dreaming can, over time, bring up disturbing imagery and challenging situations for the dreamer. It’s not all fluffy bunnies and celebrity fantasies in the dreamworld. Sooner or later, you have to face your fears. In my view, and the view of many lucid dreaming scholars, establishing a secure container is essential to a healthy lucid dreaming practice: by this I mean having a social support network, a healthy home life, and the time to go deeper into process. These are just a few of the prerequisites to success, and can also prevent the occurrence of nightmares and scary “false awakening” type dreams along the way. These dreams won’t make you schizophrenic, but without proper support, they can agitate your mental state and possibly re-strengthen the fears that came up in the dreams. Unwanted lucid dreams is a real problem for some people too; in these cases, it’s best to treat too many vivid and nightmarish dreams as a red flag, find ways to relax and ground yourself, and seek professional help if it’s disrupting your life. My heart goes out to the survivors of the Tuscon tragedy, and to the shattered families who are picking up the pieces. Please join the discussion. I will delete any comment that I arbitrarily deem too snarky, full of hatred or intolerance. Whoa, how incredibly spooky feeling. Thanks for sharing this story, and may the families related to this tragedy find some peace in their most unfortunate losses. Thank you, Ryan, for the link to the talk by Elyn Saks. I found her talk to be both moving and enlightening. yeah, her message is powerful: mental illness is hard enough before being black-sheeped by ignorant fears and sound bites. I mentioned a piece on my website in regards to hunting. I basically said you could play about with hunting inside lucid dreams and nothing would get hurt. But whatever you do, don’t go around acting about sick fantasies inside your lucid dreams. Don’t do anything disturbing that you wouldn’t do in normal life, because that kind of stuff can alter your mind. It’s a great tool for making you better, but very dangerous for people that get their thrills going about killing people for fun. Seems he used lucid dreaming for purposes it’s not meant for and the fantasy took over his mind. Tragic stuff for the victims. you bring up an excellent point, which pulls on the ongoing debate about dream ethics within the dream. The neurological fact is, the brain cannot differentiate dreaming experience from waking life experience. the same neurons fire and wire together. So if you spend your lucid dreams engaging in complusions that you wouldn’t normally do, there’s a good chance you’re training your brain to actually do so in waking life. I believe strongly in cognitive freedom — we should not judge ourselves or others for their dream content. But in lucid dreams, we must take taking responsibility for our future intentions… or we are setting ourselves up for suffering in waking life. That’s the creepiest thing I’ve ever heard! I really admire the way you handled it, both in your initial correspondence with Loughner and your responses to Gawker. You stayed true to yourself, true to dream research, and true to good moral sense. thanks KB. part of the decision to be completely transparent about the correspondence is so that it can be a useful case-study for other dream researchers and educators who spend a lot of energy working with the public. Makes you think twice about every email you’ve ever written! Also, I am thankful to live in a country where my dreamwork is protected by free speech. Once you found that you had, indeed, corresponded with Loughner, did you ever get back to Gawker? And if you did, where and how did it go? This story is remarkable to remember what you usually do in your site: lucid dreaming is a way to develop and explore knowlodge, have fun… but no to replace essencial elements of life, like family, friends or a social circle. Another good aspect to take care is when somebody is trying to solve some interpretation from dreams… specially repetitive dreams. I always try to explain that I m not a psycologist and it is important to discover and understand what is happening. Congratulations for your ethics and exemplary work! Way to call out the logical fallacy in all this Ryan! Hopefully people will get that who don’t know much or anything about lucid dreaming and want a witch hunt. I also hope this sensationalized story helps inform people about the true nature of dreaming and mental illness as separate but also connected sometimes as far as states of consciousness are concerned. For instance maybe schizophrenic hallucinations are simply the dreaming mind spilling out into waking physical reality? Maybe having delusions or paranoia is a story being weaved in our consciousness much like a dream is when we’re asleep? It all seems to be a spectrum of consciousness after all. I hope these connections are looked into more and more instead of this dualistic mainstream black and white thinking of what’s normal or abnormal. That kind of awareness is long overdue in my opinion. For instance if we’re going to talk about infamous people who are lucid dreamers let’s also talk about widely admired famous people who are ludic dreamers like some of the biggest filmmakers today: James Cameron, Christopher Nolan, and the Wachowski brothers. While their movies do have violence they also explore deep themes of consciousness and have very positive messages that have reached millions of people. 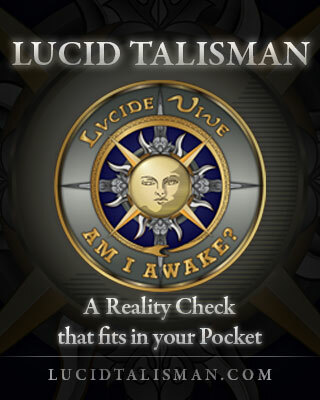 Those guys clearly aren’t “crazy,” in fact they owe a lot of their success to the visionary state of lucid dreaming. I’m only pointing this out because we love to use famous people so much as our mythological figures of what’s good and bad and of course we like to do that with infamous people too. Let’s look at the big picture of what kind of people experience other states of consciousness (not just filmmakers of course but oh yeah, many of the most beloved sages and artists throughout history), not just one person who murdered others because he was very mentally ill and perhaps no one paid enough attention to it. When waking reality seems very surreal to people we do tend to write them off and forget that we don’t really know what is real at all philosophically. There’s a big shadow side to not being able to admit that we don’t know anything for sure, we project these defensive stances on what’s real and what’s right and then we get really attached to them without realizing how much we’re using something that is a defense mechanism in the first place to wildly expand into actually judging other people based on an insecurity so we don’t have to face the uncomfortable unknown. I think that’s why people who drink a lot of alcohol often want you to join in with them, they want you to get just as drunk as they are so you don’t notice their sloppy unconsciousness. You’ve taught me not to be “flippant” in replies to anyone on my blog …. If you remain kind and courteous to everyone (even spammers?! ), then there will never be a “thread” for a journalist to follow up on. Well handled, Ryan!